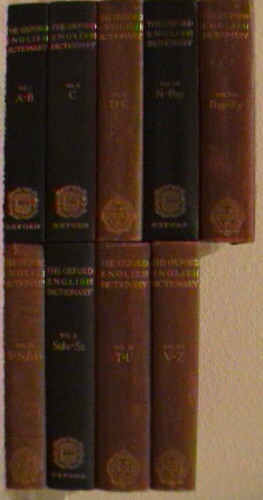 Over the past few years, with great attention and care, I have collected nine odd volumes (out of twelve in the set, not including supplements) of the Oxford English Dictionary, First Edition (that’s first edition, though not first printing, which was titled A New English Dictionary on Historical Principals) and am now reluctantly ready to part with them. While the lexiconophilist in me hates to part with this treasure, my practical side tells me that these volumes are redundant for me (since I have the complete Compact Edition, with supplements) and are a burden I should unload before moving across the country. Even though they are incomplete and odd, I really wanted them to stay together. I was happy to find that the eponymous president of the publishing company for which I work, himself a fellow bibliophile, has offered to host my collection in the lobby of our California office, alongside the other books that spill over from his huge personal library.